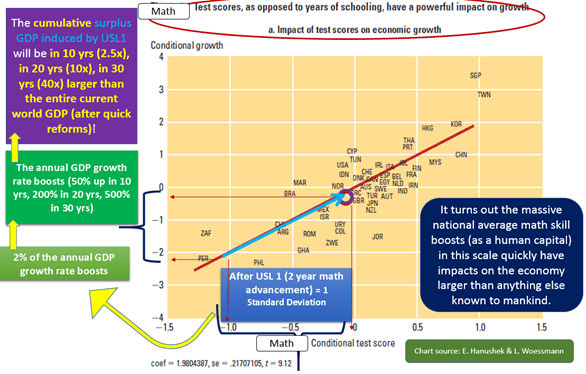 The human capital aspect here – in our case the USL 0.5 (by boosting the national average school math by 1 year rapidly) or USL 1 (by boosting the national average school math by 2 year rapidly) and their massive boosts of the (Real) GDPs as captured in the following chart – was originally based on the discovery by Hanushek and then followed by Woessmann. Roughly speaking 1 Standard Deviation progress of PISA or TIMSS cross-country math scores (which is roughly equivalent to boost the national average math scores by 2 years) mean that you can add 2% surplus Real GDP per capita growth rates in your country. We put the following references by Hanushek-Woessmann here from OECD, World Bank, UNESCO, and Harvard as USL1 is trying to collaborate with various governments, the UN, primarily starting with the OECD countries and African Union. Notice in this diagram that is based on the cross-country cognitive skill test scores – in our case particularly national math scores of PISA and TIMSS, etc – the entire gamut on the x-axis is about 2.25 standard deviation (which roughly corresponds to about 4.5 years of school math level differences) – corresponds to about 4.5% of Real GDP growth rate difference between the top of the world to the bottom of the world, in terms of math and GDP growth rate. What USL 0.5 (with states is to crosss 1/4.5, which normally take a few decades or more) and what USL1 will do is to cross 2/5 (which normally take half a century or more) of the entire ocean of math skill differences. For more confirmations relevant for the USL1 claims, please check the following from OECD, World Bank, UNESCO (UN), and Harvard. You can view them all online.